RightLobeMath.com - Online Mental Math Program! Build your child's future with a solid foundation in basic numeracy, master all of arithmetic and advanced mental math. Learning elementary school math has never been so fun and engaging, motivating students to reach higher. This math program is for anyone ages 3 to 103, wanting to improve their arithmetic skills and develop mental calculation. Moving in small incremental steps, students will start with basics, then master complex arithmetic computations, including decimal and negative numbers. Building amazing mental calculation capabilities with both speed and accuracy is what it's all about! If math is the great enabler that creates opportunities for a better life, then rightlobemath.com is the great equalizer! Building a strong foundation in numbers and arithmetic will unlock the future potential learning of all children. RightLobeMath.com makes it simple, fun and effective! 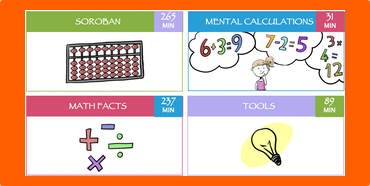 Learn to visualize numbers and calculate in your head! Master arithmetic in 6 simple steps using Japanese abacus. Memorize the multiplication table and all of your single digit facts! 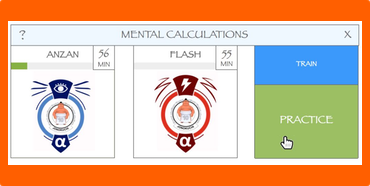 Flash Anzan and other useful tools to help you learn and compete. "This week for the first time I have seen my son being really proud of himself and so scientifically excited, because of his scholarly achievement with your math program. It happened for the first time in his life. I am so thrilled and thankful!" "I never thought I was good in math, but I can do THIS!" "The first day I introduced the program, my students worked nonstop for 45 minutes, pushing themselves, cheering, and wanting more... Without reservation and with much enthusiasm I highly recommend this program to everyone passionate about teaching..."
Math Facts and Tools modules. On this control page, students can choose what they would like to work on next, view statistics, redeem hard-earned credits, and keep an eye on their friends. Always aware of where they are in their math journey, students can train and re-train anytime with easy-to-follow videos and training tools. As students develop their math skills, they equally advance their mental calculation capabilities thru our unique Anzan, Flash and Audio modules. 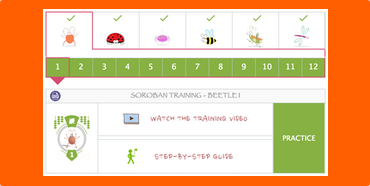 Math training with Japanese Abacus (Soroban). Walnut Creek, CA 94596 US. Copyright © 2019 RightLobeMath.com. All rights reserved.